Got a call from the customer service manager from my mobile phone company asking to confirm my address, so that he can send me a box of mooncakes. This came to me as a surprised as I no longer used to be their Diamond VIP, chalking up ridiculous phone bills. Still, who can say no to a box of mooncakes, right? 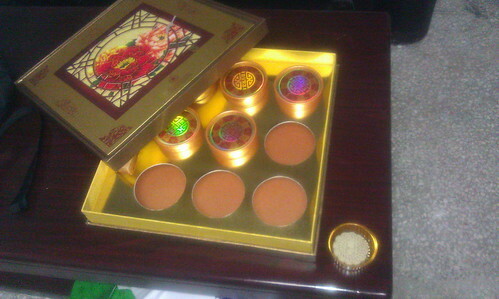 So, it was a few days later before the mooncakes arrived by courier. Fwah.... so big the box of mooncakes ah?? How to finish like that?? Then as I opened the box to sample a piece. I can't, despite it being free, help it but still feel cheated. Oh well, Happy Mid Autumn Festival 2011 (12 Sep 2011) in advance to everyone! p.s. HTC phone really take sucky pictures. I can't wait to change phone but it will have to wait till Mar 2012 when my recontract period is due. Haiz. Should I take out my Lumix and start using it again? at least you received a box, I don't even get any! Oh well, Happy Mid Autumn Festival! Aiyah. You want mooncakes very easy one. Just teh a bit on plurk or twitter and you should have to fend off truckloads of them from cheehong kias.